An online reputation is very important, and since we are in Alliance to provide services to those customers, our reputation is joint. We have a vested interest in the quality of service produced by our Allies, because poor quality will come back to reflect poorly on our site and network. We therefore cannot engage in business with any potential Ally that provides inferior quality. Businesses get one positive review spontaneously out of every 300 satisfied customers they serve. People are simply interested in getting on with their life, and although they appreciate the service, it is not a big deal for them. It does not seem worth the effort to post a positive review. On the other hand, out of every 2 dissatisfied customers, one will post a negative review. And what does that mean? It means that if a business has a ratio of 150 very happy customers for each unhappy customer, their online reputation will be mediocre, with a balance between good reviews and bad reviews. And even the best quality provider will have the customer who is mean, had unrealistic expectations, doesn’t get along with staff, felt indignated when some part of their service could not be provided as agreed regardless of the best intention and prudent measures taken, or perhaps the person who simply was having a bad day and felt it was OK to take it out on a vendor. 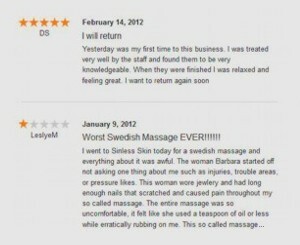 The example review in the photo is an actual review of a customer who on her third visit to a spa did not get along with the therapist that provided her massage, and found the experience uncomfortable. She was verbally abusive and mean to the therapist, and the therapist, who had years of experience with outstanding ratings was following established formal protocols for the type of massage being provided, and was proffesional in delivering the service even in the face of the adversity in the attitude of the customer. Some things in the review were simply untrue, like the jewelry and fingernails, as it was a company policy that was upheld and respected by the estheticians simply out of professionalism, and the rating of the spa environment as deplorable. It is hard to say what actually happened in the privacy of the room, but the conditions of the facility were undebatably in a top position for the industry, and consistently highly reviewed by other guests. It would seem that hatred took precedence over reality. The point of providing this extra detail is the following: A top rated therapist, with many thousands of dollars in advanced continuing education, in a new, top facility, with very expensive organic oils infused with very expensive organic aromatherapy essential oils, which no other spa would have included in a service, much less at an entry level price, and even when the service price paid is totally refunded to the customer, can still receive a one star rating... And that rating can even come from a customer who has had two prior visits that were good enough to warrant their return to the business... It is impossible to avoid negative online reviews. They are simply a reality of the internet, and as such, they must be addressed and managed appropriately, so that they do not affect the online traffic. It is important to have plenty of reviews with specific situations mentioned, some good ones, and some excellent ones, and even the occasional bad review of the person who mistook the service for what it was obviously not. The customers who look into reviews are the smarter customers, and they pick up on those things without becoming negative about the business if they feel the business is attentive to the feelings of the customer and fair, and it establishes credibility. Having only excellent reviews usually sends out a red flag to customers. Working hard to satisfy the customer, and then being honest in reviews and comments is the best policy by far. Being proactive with reputation means that we actively seek reviews from our guests, and with their approval, post the information as feedback in the appropriate places where other customers seek reviews. We can obtain a positive review from up to one out of every 2 guests that we ask face-to-face, and that means that if there is one dissatisfied customer out of 150, there could be 100 good reviews for each bad one, more than enough to offset the damage. In the process of placing the appropriate review content to the right sites, we monitor any spontaneous reviews that may be posted, and comment if there is a bad review without being defensive. Simply providing facts, along with our understanding, showing concern for the customer's emotions and showing an interest in rectifying the situation. If the case is that our service was indeed deficient. Instead of offering a refund, which promotes further complaints, we have learned that it is optimal to offer discounts on future services to make up for any short comings. But what is communicated on the reply to the complaint is a request for the disgruntled customer to call back and ask for a specific person in charge to see if there is anything that can be done to remedy the hurt feelings. The offer is made verbally if the situation warrants it, never posted on an actual reply. If the situation can be fixed, great, and if not, we can say that we tried. Nobody is perfect, and problems will happen from time to time. The reputation management aspect of the progam is above any other reputation management service we have seen in the industry because it is 100% authentic, to the point where we there is a physical record of each customer's testimonial statement as evidence of its legitimacy. And the methodology of the program ensures higher ratings by simultaneously exposing a greater number of positive reviews, and lessening the impact of negative reviews, safeguarding conversion rates, and ultimately the profitability of the business.